A short, lively 10.00am service held on the first Sunday of each month and is aimed at the whole family. The music is led by our own church band, which is always open to new members, and the children are always encouraged to join in and help the Rev Musser throughout the service! Originating in the little village of Taizé in the Burgundy region of France, this intensely moving form of worship has now become truly international, and is especially popular with younger people. As its founder, Brother Roger of Taizé said, "Nothing is more conducive to a communion with the living God than a meditative common prayer with...singing that never ends and that continues in the silence of one's heart when one is alone again." 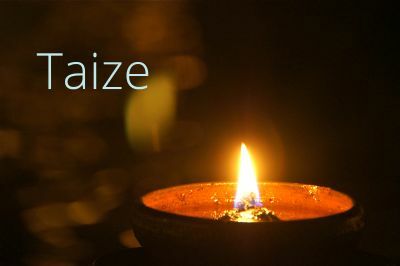 The Taizé services at St Michael's are at 5.00pm on the 3rd Sunday of each month. Do come along and join us for this quiet time of prayer, readings and gentle music by candlelight. On the first Wednesday of every month there is a short said service of Holy Communion at 10.15 in the Lady Chapel. The service lasts about 25 minutes and is followed in the church room by coffee and fresh homemade scones and lots of conversation. If you would like to join us and need transport to and from the church, please phone me and I will pick you up. This is a great opportunity to participate in a quiet service and afterwards to enjoy the company of old and new friends. Our regular Sunday 10.00am sung Holy Communion service with wonderful music provided by our organist, and a thought-provoking sermon from our priest or curate, followed by refreshments - tea and coffee in the Church Room. An occasional new service which will focus on prayer for healing of individuals, society, national and international conflicts. Festivals and Saints' Days are celebrated throughout the year.